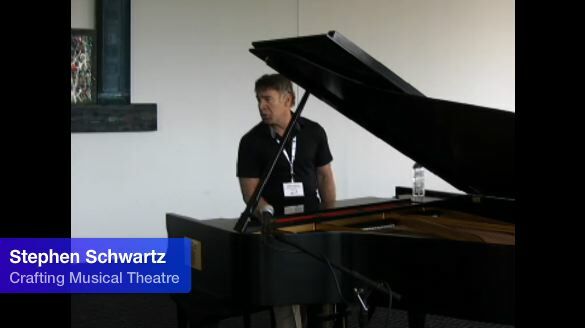 At the conference on Saturday, Stephen Schwartz gave a wonderful talk called Crafting Musical Theatre. At the end, an audience member asked if we could have a sing-a-long. I watched the cards fall one after another, as if inevitable: somebody called out that we should sing a song from Godspell. Stephen said, “Well then, it should be ‘Day by Day,’ because everyone knows that.” Then he asked if there was a female voice who could lead. I shot up my hand before even thinking about it. When I got to the piano, he asked if I knew the words; and I replied that not only did I know the words, but Robin in Godspell was the very first role I ever played onstage at the age of fourteen. What I didn’t tell him was that it was the most formative event of my adolescent life. That it helped me first understand unconditional love. That I had my first kiss with the boy playing John the Baptist, wrapped up in a stage curtain before the Saturday night performance. That, when I returned to the creative life ten years later, I realized that the light Godspell lit had been quietly burning all that time, waiting for me to come back. So glad I got to be there for it! And to meet you in person….